Common Tiger (Danaus genutia) Striped tiger. This is one of the most common butterflies of India. It looks similar to the monarch butterfly of south America. It is orange Tawny in color with black stripes and white spots hence called as the common tiger or striped tiger. It is found in India, Sri Lanka, Myanmar up-to South East Asia and Australia but does not occur in New Guinea. 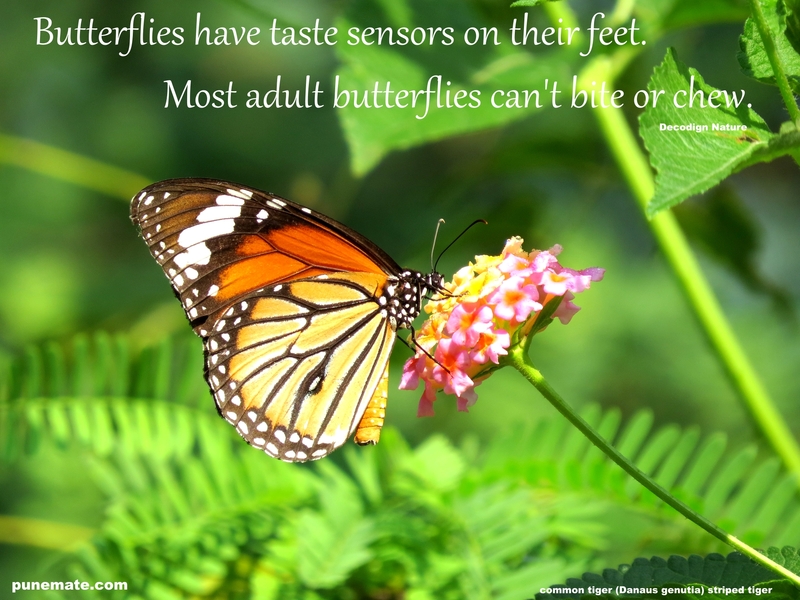 Fun Fact: Butterflies have taste sensors on their feet. Most adult butterflies can’t bite or chew. Common Tiger butterflies fake death as a tactic to escape from predators. When attacked it oozes liquid which makes it smell and taste terrible. It has the ability to recover soon after an attack. A single egg is laid under the leaves of the host plant.